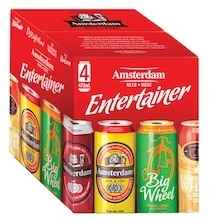 TORONTO, ON – Just in time for the holiday season, Amsterdam Brewery has released their first mixed pack, the Entertainer Holiday 4-Pack. Available exclusively at LCBO stores across the province, the package retails for $8.95, and includes cans of Natural Blonde Lager, Big Wheel Deluxe Amber, Nut Brown Ale and KLB Raspberry Wheat. Also due out soon is Amsterdam’s latest seasonal beer, Wee Heavy Scotch Ale. Previously known as Tilted Kilt, it’s brewed with “a blend of five different malts and an extra long boil (which) gives this beer its full-bodied and deep ruby-red colour.” Wee Heavy will be available on tap at select bars and restaurants, and in bottles at the brewery retail store.